Build a geo-referenced parcel fabric of all titled and surveyed Crown land parcels to a known level of quality. Link each parcel within the fabric to the Land Title Register and/or the Crown Land Registry. Create a technical infrastructure to house the parcel fabric data. Create an operations framework to ensure PMBC remains current and complete. Create an electronic submission interface to provide verification and integration of survey and parcel data submitted by land surveyors with each new survey plan. Establish a process to integrate new survey plans so that the fabric is constantly improving parcel accuracy and best reflects the most current and complete information. 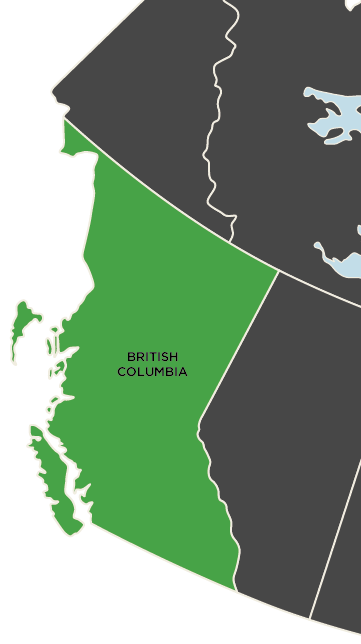 The Land Title and Survey Authority of British Columbia (LTSA) is a publicly accountable government corporation responsible for administering the land title and survey systems in British Columbia (BC). Stakeholder demand for an easy, efficient means of accessing land title and survey information using an electronic map of surveyed parcels in BC has been a longstanding need. Intuitive map-based access to this information improves business efficiencies for government and private industry, and provides value to the general public. To support their stakeholders and operational efficiencies, LTSA required a single, complete, trusted and sustainable spatial GIS representation of the over 2 million active titled parcels and surveyed provincial Crown land parcels within the province of BC. 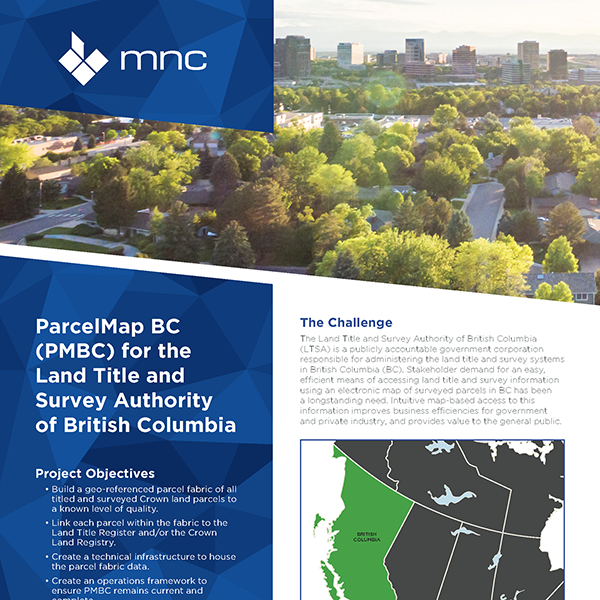 The Parcel Fabric: created a single, complete, trusted and sustainable parcel fabric of every active titled parcel and surveyed provincial Crown land parcel within the province of BC. Online Survey Plan Submissions: customized software, based off of MNC’s digital survey submission platform, to automate the electronic submission of digital survey plans to LTSA for operational maintenance. Cadastral Tie Collection: collected approximately 4,500 cadastral ties in the field that were integrated into the parcel fabric. These ties support ongoing spatial improvements to the parcel fabric. MNC has successfully completed two of the three components of this project, the Parcel Fabric component will be completed in May 2017. Improve speed and efficiency of land-related research, planning and business decisions through a visual representation of the parcels in the land title register and Crown land registry. Minimize possible data discrepancies and confusion by reducing the need to consult separate spatial systems in BC. Supports faster and more accurate real estate dealings by using the visual representation of the parcels in the land title register. Reduces routine data maintenance tasks and overlapping parcel fabric efforts. Best Practices Compliant: completely adheres to the fundamental principles of a survey-aware fabric where all survey dimensions, and accuracies associated with the dimensions, are preserved and not altered. Comprehensive Integration: parcels are linked to their corresponding records in the Land Title Register and/or Crown Land Registry. This will allow users to conveniently access related parcel information such as titles, plans, documents, and tenure information. Survey-Aware Parcel Fabric: parcels are dynamically geo-referenced to the underlying provincial survey control network. This enables the overall parcel fabric accuracy to be continually improved as new geo-referenced survey plans are integrated into the fabric. New survey plans retain original survey observations, even after successive “best fit” adjustments have been made. Transparent Quality: each parcel within the parcel fabric has a known level of spatial quality. This will provide parcel fabric consumers with the information necessary to make informed business decisions. This will help target future spatial accuracy improvement programs by identifying areas of the fabric where spatial accuracy is poor. Please click here to download the case study document.